If you are in the process of searching for a party bus in Tecumseh, then rest assured that your search is now over. Here at Rockstarz Limousine and Party Bus, we not only provide you with the perfect location for your party, but our customer service will also far outstrip your current expectations. 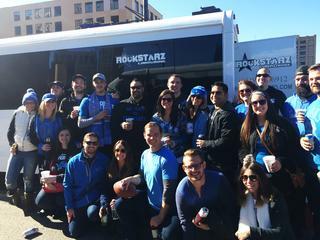 If you want to rent a party bus, then it makes sense that you may have a number of individual concerns. For example, it is common to worry about the number of guests that can come along, which is why we have tried to expand the space available via clever design to ultimately allow you to have even more guests than ever before. Our Tecumseh party bus rental service is also designed to provide you and your guests with a wonderful place to just relax and have fun. As you step on board, you will always feel as if you are stepping into your private nightclub, and to be honest that is exactly what you are doing. From the comfortable leather chairs, to the sound system blasting out your music along with the light display, this is going to be an amazing experience for everybody who is present. In the past, individuals have used our Tecumseh party bus service to help them celebrate a range of special occasions. From a normal birthday to a special anniversary, or perhaps a bachelorette or bachelor party, no matter the event there is no doubt that we can help you celebrate it in style. So, if you live in the Tecumseh area and you are actively seeking a party bus, then give us a call here at Rockstarz Limousine and Party Bus. The other option is to contact us via our website and someone will be in touch as soon as possible to discuss your own individual needs.